WASHINGTON – Metro’s Whack-a-Mole efforts to keep up with certain maintenance issues and continued problems with dark tunnels and potential tripping hazards that could get in the way in the event of an emergency are among the issues highlighted in newly released federal inspection reports. Updated summaries of Federal Transit Administration findings show Metro currently has 747 open remedial actions to address, nine of which are still tied to Metro’s initial round of 24/7 work zones that began in 2016. In March and April — the latest months with complete inspection reports available — inspectors found some issues resolved, only for other similar problems to have cropped up in the same areas. In other cases, inspectors could not confirm any previously identified issues had been resolved. Water leaking from tunnel walls or ceilings directly onto the electrified third rail, other parts of the tracks or electrical boxes remains a problem across the Metrorail system. In several cases, inspectors described leaks allowing water to “saturate” the rails leading to rusting and other problems. In addition to the leaks, there are mud and trash-clogged drains, signs of water in some train control rooms and power substations, and inspectors even found a flooded exit shaft right next to a power substation at White Flint. On parts of the Blue, Orange, Silver and Red lines, inspectors found several locations without proper lighting. Some of those spots also had things in the way of potential emergency exit paths. On the Blue Line between Addison Road and Benning Road in March, inspectors found a long stretch where “tunnel light lenses were covered in dirt and soot, which severely restricted the illumination of the tunnel.” Nearby, tunnel light lenses had come off the wall and were lodged near the third rail. “Potential trip and fall hazard conditions were observed in the area, including other track material, mud, water, unsecure expansion joint spacers, wood and other objects that could interfere with walking conditions,” the federal inspector wrote. Between Federal Center and Stadium-Armory, an inspector described “sub-standard lighting” with the tunnel lights covered in dirt and soot. On the Red Line between Silver Spring and Glenmont, another report described more dark stretches. It was also too dark in the West Falls Church Yard power station, where an exhaust fan flap was artificially held open with a wire for ventilation. In many other parts of the system, inspectors also found extra rails, fasteners or other debris blocking potential emergency exit paths that would make navigating a potential emergency situation even more challenging even when the tunnels are properly lit. About two months after the Martin Luther King Jr. Day Red Line derailment downtown, an inspector found problems in the area where the shattered rail was replaced. “Throughout the derailment area where the rail was changed, there were multiple broken and bent studs and missing clips on both rails,” the report said. Inspectors separately found many issues in March in the Alexandria Rail Yard where proper seals were missing to keep water out of electrical cable assemblies. 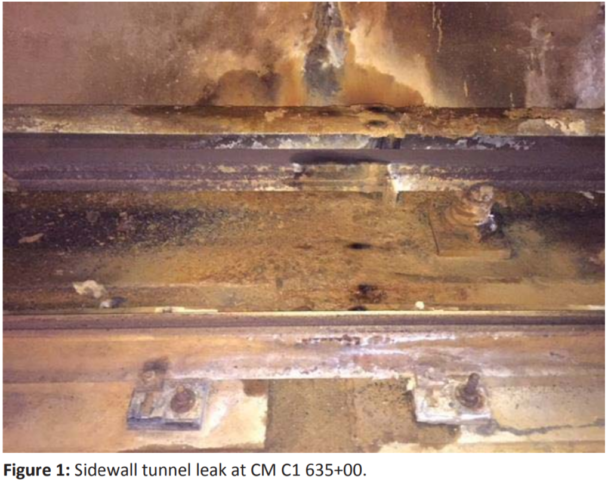 On March 8, a federal inspector with Metro track inspection teams noted a 10-foot stretch of rail on the Red Line with no working fasteners that was sliding back and forth up to 3/8 inch at a time. While Metro placed a medium speed restriction on the tracks, the FTA inspector thought a better precaution would have been a slow speed restriction.